It all ends up here really: Dancing in a circle of community – or better yet, tribe. I’ve shown this painting many times and it is very much a satisfying crowd-pleaser. It was done quickly and easily, coming out of a session when the painting group had been pushing me to take on the power and the mantle of sweet green magic I was toying with. In fact, they wanted me to declare them my coven. I couldn’t speak clearly about it in class but I went home and the image of all of us as dancers flowed out of my fingertips in half an hour. When I was eleven years old I nursed a fierce longing to dance naked in the moonlight. I even wrote a poem about it. But sadly it was many, many years before I found the courage to do so. In those days the best I could even imagine was doing it solo and secretively. Now my great dream is to have this circle dance be part of the normal course of affairs. 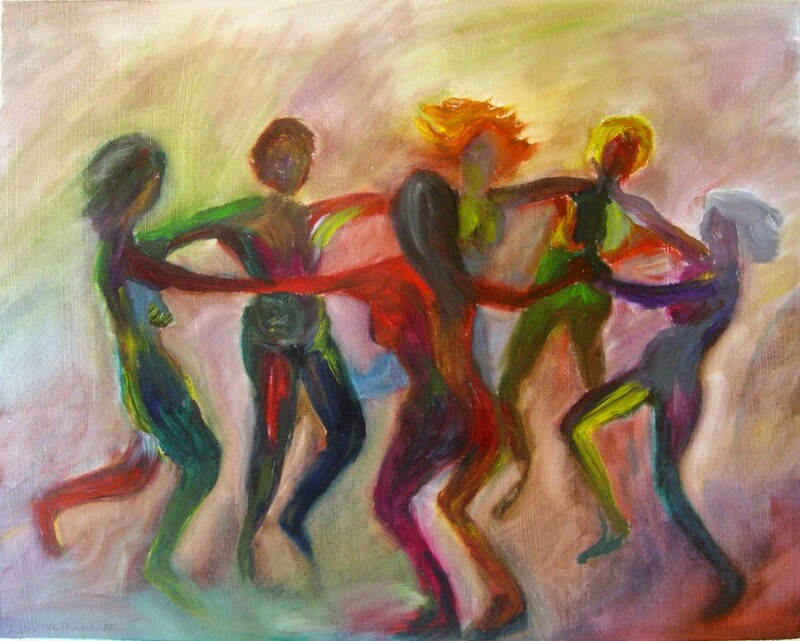 This painting is of women, but I now know the dances can include both genders and all ages. It should be noted that these are the same six figures as the five forks and central figure in “Fierce Compassion” – i.e. those who wield the cleansing swords of truth are often those we dance with most joyously another day. Written for Out of the Ashes Show, North County Recreation District, January 2004. This painting is not for sale. However postcards and a 8.5 x 11 print are available.